Home to Four Mountains, You'll Find Skiing from Green to Extreme! The 707 banked as it made its approach, descending steeply to the small airfield below. As I disembarked onto the tarmac, the cool crisp air rushed beneath my jacket, a reminder of the reasons Colorado has such legendary skiing: high altitudes, cold temperatures and a palette of steep mountains on which to cling. I was in Aspen. I didnt come to watch the celebrities: Arnold Schwarzenegger schuss down the slopes of Ajax Mountain, or catch a glimpse of Kevin Costner roaming the streets of the quaint Victorian town. I came to find out what John Denver was singing about in "Rocky Mountain High." I had heard this was a skiers paradise  a place that not only filled the needs of the body, but also nourished the minds and souls of its visitors. The vast Roaring Fork Valley, spreading west from Aspen, is blessed with breathtaking views and four ski areas that can whet your imagination as well as your ski suit: Aspen, Aspen Highlands, Buttermilk Mountain, and Snowmass. Each has its own character and forte  steep and deep, bumps that turn knees to jelly, wide cruisers, or boarding terrain for the best air junkies around. Here you can mix and match your vacation and sample each area during your stay. Aspen Mountain, called Ajax Mountain by the locals, is often referred to as the athletes mountain. The only green youll find on its slopes is the foliage. There are no "Easy" runs. 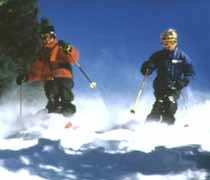 Sixty-five percent of the skiable terrain is "Most Difficult and Expert." 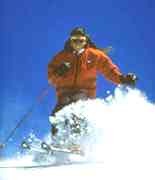 That accounts for lots of steeps and bump runs open only to skiers, like "Kristis" and "The Face of Bell." Aspen is a "No Snowboarding" zone. The Silver Queen Gondola will whisk you up over 3,000 feet in 12 minutes. You can ski back down on big, wide-open cruisers, like "Copper Bowl," "Ruthies Run," or "Spar Gulch." The challenge? Can you beat the Silver Queen back down? You may feel like the World Class Racers did last November when the Mens World Cup Super G and Giant Slalom returned to Aspen Mountain. Photo: ASC, Tom Zuccareno Aspen Highlands is the locals favorite with its infamous radical terrain, and Colorados steepest. You might feel a bit heady as you gaze at the magnificent views of Pyramid Peak and the Maroon Bells which soar over 14,000 feet in elevation. Or, you might feel a bit giddy as you head into double-black diamond "Steeplechase" or "Olympic Bowl." Theres plenty of gladed skiing, too. Aspen Highlands offers a challenging backcountry skiing option. For $99, including guide, you can experience off-piste ski slopes through the Highland Bowls Y Zones and the adjoining B zones. Aspen Highlands isnt just about the radical. There are plenty of blue cruisers for both skiers and snowboarders. "Broadway," "Upper Robinsons," and "Golden Horn" are sweet. For the novice, the lower mountain has lots of green runs that are a "Cakewalk." Buttermilk Mountain is just three miles from Aspen. Its reputation is of a gentler kind than the Highlands. Groomed runs are as smooth as corduroy which make for a great family area and for those who are perfecting carving skills. Buttermilk is known as a premier learning mountain with a new three-day course that allows beginners to progress at a quick pace. A "graduate" day is offered to help keep the learning going. On this fourth day, it is guaranteed that you will be able to successfully ski a run at Aspen Highlands, or get your money back. One of the best-kept secrets about Buttermilk is the powder stashes found days after a storm in the gladed trails and black-diamond runs. Snowboarders will find paradise  one halfpipe and a terrain park. 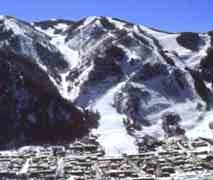 Snowmass, 11 miles from Aspen has this countrys largest vertical drop, 4,406 feet. It is a diamond in the rough  each facet displays a different personality. Its a snowboarding Mecca. "Coney Glade" is where the air junkies get high. Two halfpipes and a terrain park cater to different boarding abilities, so theres lots of terrain for learning and expert moves. Four mountains comprise its snowmassive terrain and 20 lifts. Theres "Elk Camp," an intermediate zone for cruising and some tree skiing on "Long Shot." Then there are the "High Alpine" and "Big Burn" regions that access the expert terrain of "Hanging Valley" and the "Cirque." 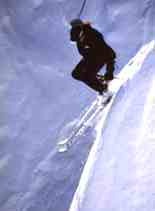 Double-black diamond runs that will sober most skiers and boarders can be found on the "Cirque Headwall" and the "Hanging Valley Glades." "Sams Knob" is the fourth mountain in Snowmass. Here youll find a mixed bag of tricks, from green to black and everything else in between. Hopefully, you wont end up black and blue after youve faced the "Slot" or "Zugspitze." 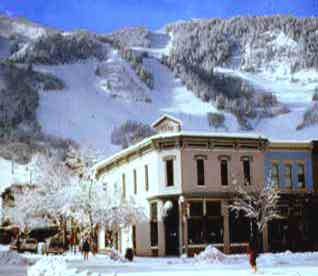 The town of Aspen lies in the shadow of its famous mountain. Its history is as rich as the old west. Aspen grew from a silver mining town to a world-class ski destination in less than a century. Quaint Victorian homes line its streets, while western-style store fronts are filled with upscale boutiques, fine restaurants, art galleries and real estate offices. Aspen is the scene in which to be seen. It is not for the faint of wallet. Real estate prices in town escalate from $1 million. There are affordable digs in which to vacation and some good eats deals like the free coffee, cookies and cider from the on-mountain concierge centers, or Happy Hour deals at local eateries. There are nearly 50 art galleries and studios around town that showcase the works of renowned masters like Dale Chihuly, LeRoy Neiman, Picasso, Chagall, and others. Aspen Art Museum offers a year-round program of art exhibitions and lectures. Snomass has something to offer the art devotees, too. Its Anderson Ranch Arts Center is located in the village and offers year-round exhibitions. But, it is the music that makes Aspen a cultural Mecca. The Aspen Music Festival offers winter music concerts in addition to its summer series. I was fortunate to see cellist David Finkle and pianist Wu Han in the Harris Concert Hall during my trip. It is an elegant music hall Id liken to the interior of a Stradivarius. The Wheeler Opera House, built in the mining heyday a century ago, has been beautifully restored and is a an ideal venue for foreign films, lectures and musical groups. During my stay, French guitarist, Pierre Bensusan graced its stage with his sophisticated music. Aspen after dark is filled with live music. The J-Bar at the Hotel Jerome features local bands, while the St. Regis lobby offers jazz nearly every night. If your feet and legs have anything left in them, you can dance the night away at The Rock or Shooters Saloon and Dance Hall. It is the atmosphere, the culture, and the mountains that makes The Roaring Fork Valley a great place to visit. Whether its schussing a slope, hanging out in a pub, listening to soothing music, eyeing a rare Dali, savoring a delicate French sauce, or attending a lecture, there is more variety here than Heinz 57. In Aspen all the senses get touched in one way or another.